Vine is going down unless another company buys it. Here's how to get your memories out of the service right now. Short-form video creators everywhere were dumbstruck at the end of October when Twitter announced it was killing Vine. There’s still no word on when Vine might see its final day, and there are rumors that Twitter may sell Vine to a third-party, giving the service new life. But the fact is Vine’s fate is still uncertain, and anyone who can’t get enough of their seven second videos should back up their memories. It’s likely Twitter will provide a way for users to export and save their videos should the end truly come. For now, here are two ways to save your Vine videos to a PC, as long as your Vine account isn’t private. 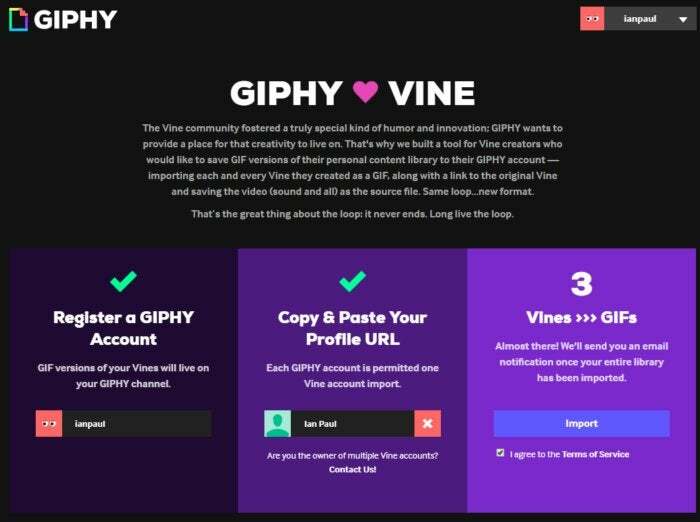 The most publicized tool for grabbing your Vines is a new site created by Giphy. It will take your short videos and turn them into animated GIFs hosted publicly on Giphy. The source files for all videos will remain intact including sound. Log in to the Giphy loves Vine website and create a new Giphy account if you don’t have one. Next, drop in your the URL for your Vine user name. If you don’t know what your username is, log in to your Vine account on Vine.co. In the upper right-hand corner hover over your profile picture and select View Profile. On the next page, copy the web address, drop it into Giphy, and click Import. Giphy will notify you via email when the import is complete. Once your Vines are imported you can download them one-by-one. To download the original source file with sound, click on your GIF of choice to go to its dedicated page on Giphy. Next, click the Advanced tab below the image and look for the “Source Download” entry and click the Download button next to it. Giphy only allows one Vine import per Giphy account, though you can contact them directly if you have multiple accounts. The downside of Giphy is that it only saves Vine videos that were created by you. Any “Revines” (Vine videos of others that you re-posted to your account) will not be saved. If you want to save those too, you’ll need this next tool. 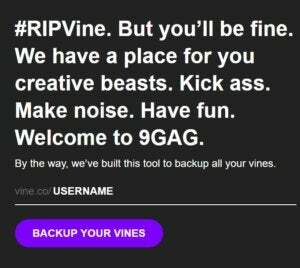 Another option is to use RIPVine.co from 9GAG, a social media site that hosts animated GIFs and other images. 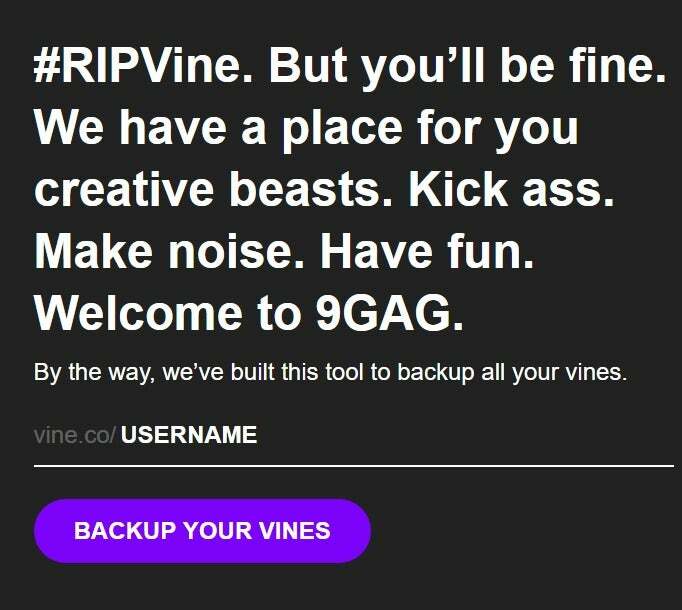 RIP Vine grabs everything from your Vine account including anything you’ve re-shared that wasn’t created by you. The process is a little bit simpler than Giphy. First, you don’t need an account with RIP Vine, but you will need your Vine account address once again. This time, however, you only need to enter everything after the “u” in the address. For my account that would be “u/960257503373955072,” for example. Once you’ve copied that part of your Vine profile address paste it into RIP Vine after vine.co/. Now click Backup your Vines and the process will begin. 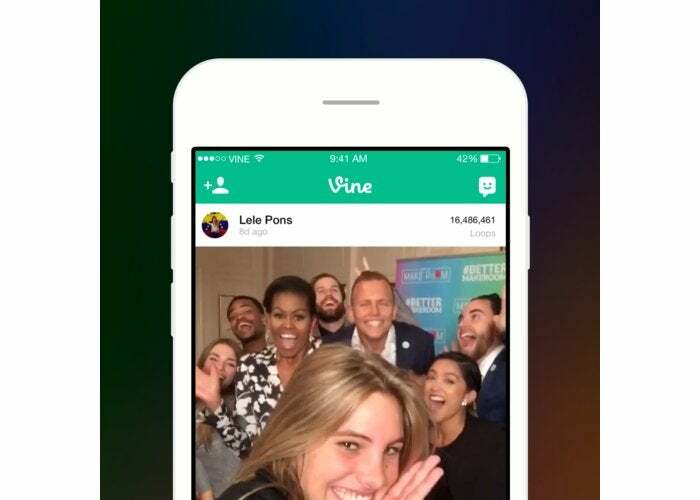 Don’t close the tab, and once it’s done your Vines will be available on RIPVine.co. Again, they’ll be public. Now just hit the big Download button below each video to grab it.